3 How to produce granulated tea? The tea is made from young leaves and unopened kidney tea bush. 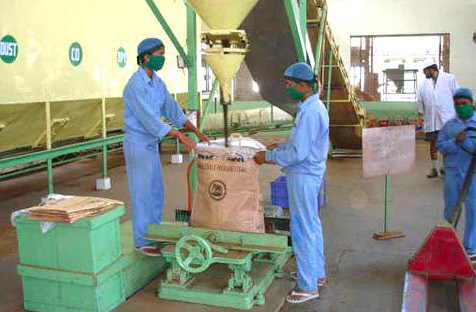 But, before you get to our table, it passes certain stages of processing tea factories. Originally produced for centuries Chinese only green tea. In some cases, the harvested leaves in the sun podvyalivayut, dried, pulverized, made pasta and sculpted small cakes, in the other - slightly dried leaves dried and cut, sometimes pressed. To the court of the emperor brought the most valuable, slightly dried and carefully dried the young buds of spring tea shoots (Tips), which kept all the freshness and flavor. The first deliveries of tea in the other countries were namely green tea. Caravans went to distant Russia, in Western Europe, but green tea is very poorly tolerated in long journeys, despite, that he very carefully packaged. therefore, enterprising Chinese, due to increased demand for tea, It occurred to prepare tea for foreign merchants on new technology. They began to wrinkle and curl previously slightly dried leaves, allowing them to be oxidized in air. Then repeatedly them lightly roasted in a skillet, continued to roll. As a result, such a technology has turned black tea "konzhu", smelling smoke. Its something and began to offer to foreigners, it is well kept and had a wonderful flavor brewing, aroma and color. From the partially oxidized (fermented) later leaves began to produce the so-called Red tea (oolongi). Modern tea manufacture methods may vary quite strongly in the manufacture of a variety, but, the most important stages of preparation technology black and red teas should include: zavyalivanie, curling, fermentation, drying, Sort Order. For green tea completely eliminated fermentation processes. Besides, the tea leaves are subjected to so-called fixing, to prevent accidental fermentation. In the fixing process includes: drying, steaming, exposure and then subsequent twisting and drying. Tea leaves collected at the beginning subjected to preliminary sorting and purification. Then, it withered in special drums, blowing hot air, as a result it becomes soft, pliable and ready for rolling. The next stage - leaf rolling, carried out by special machines, so-called scooters. They squeezed and twisted leaves with the release of juice, destroying the sheet structure for subsequent fermentation. This process occurs without intervention or human machines. Leaves, gradually oxidized in air, begin to take on a reddish-brown color and distinctive flavor. In the production of red tea, the fermentation process quickly interrupted, as soon as the leaves on the edges pobureyut. The drying step takes place in metallic chambers, wherein the moisture content is reduced to 2-5%, maintaining the temperature 95-100aboutWITH. Some tea varieties require re-drying to provide more long-term storage. The resulting semi-finished tea is passed through a sieve, sorted according to the fragmentation of the leaves. Then the tea is packed in a box, studded outside with tin, sometimes as a finished product, but often aiming at a special tea-packing companies, wherein a mixture composed, bathing, cloven by grades and marks. How to produce granulated tea? In the middle 20 century, the British introduced a new technology for the production of granulated tea. Shorten it is called "STS (Сut-Tear-Curl)» (cut-grind-twist). In production use "STS" machines, instead of conventional rollers. They are finely cut sheet and rolled into small beads, granules, which is fermented and dried. Such tea is obtained from the average quality of the sheet, but it is no different from similar kinds of traditional technology, It gives a rich taste and color.